I write to you as a serious grown up, sitting here in my apartment, roommate less for another week, reflecting on life and shifting all the much-loved time with my roommate to some really productive things. I’ve taken to actually watering my one plant, cleaning my room, paying bills and running errands that most people take care of within a few days of needing something but usually take me months. There’ve been some important conversations and revelations with my friends. To my dismay, I found out that one of my closest friends prefers the cardboard flavored animal cracker to the quite conveniently transportable AND fashionable AND delicious barnum & bailey animal cracker box which we’ve decided are really “animal cookies.” While I find her opinions to be wrong, I’m glad we can be honest about these things. 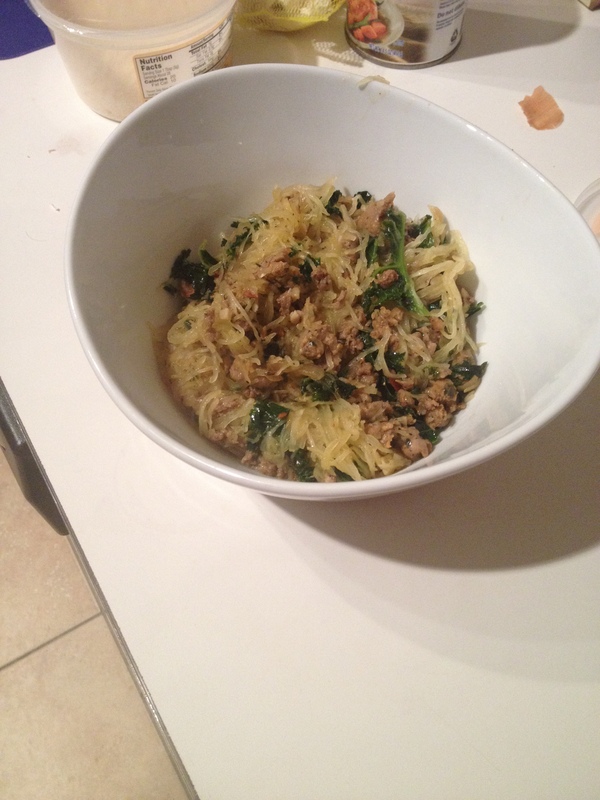 On the positive side, Jason DeRulo has two new songs out, I’m going to the lake this weekend and this spaghetti squash with kale and sausage was delicious. Though I will miss Christine dearly, we have decided to have a roomie food challenge from Atlanta to Boston. Since we used to cook together, we want to facetime while we are making our favorite recipes so I can help her know JUST WHEN to stop stirring her muffin batter and she can share her attempts at our laundry list of recipe ideas. If you can master any of them first and send to us, we’ll be amazed….the list includes Basic girl dip (goat cheese, kale, dried cranberries, candied pecans and whatever other basic things you can think of), more vegan peanut butter pies, granola recipes, the best tahini dressings, tahini baked goods ,anything with kimchi, and mediterranean seven layer dip take 2. OH and anything that involves slow-cooked short ribs or stewed tomatoes. On to this recipe. I made this a few months back with my friend Ed whom you’ve met in earlier posts. 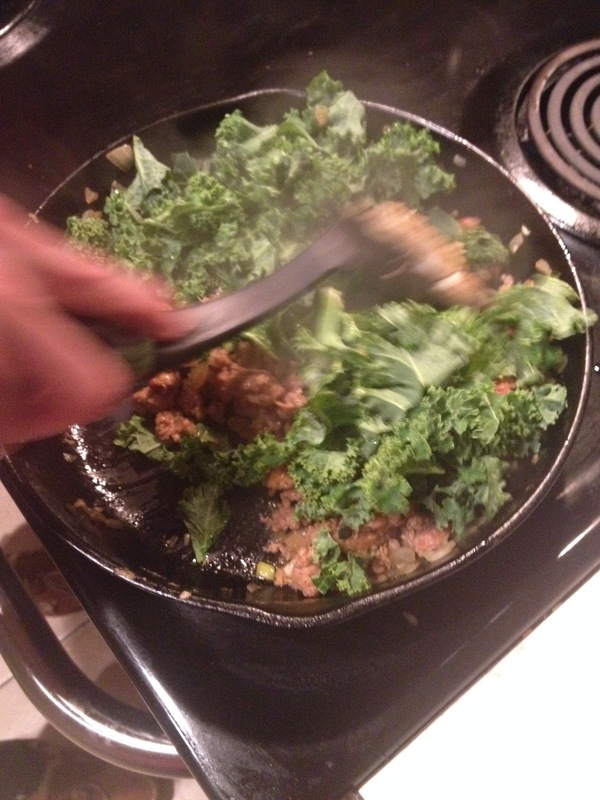 I like stuffing vegetables with meat and garlic and I also love the kale/sausage combo. This was ideal for a cold day, but could still be a good spring recipe with the amount of greens you could substitute right now. Speaking of greens, who has ever heard of green garlic?? I went to this farmer’s market a few weeks ago and tried to buy green onions at literally three different farm stands only to be stopped by the soft spoken vendors who noted, “ah, no, see the flat stems, ah yes, that’s green GARLIC.” So apparently green garlic is a green onion with a flat stem. Who would’ve thought. (I’m gonna get to the recipe I promise). I HAVE to tell you guys about the ricotta fritters first though. My friend Justin and I walked around tryna be all skinny minny, looking at the bread table and not sampling anything until wafts of *FRIED SOMETHING WITHIN WALKING DISTANCE” floated from this Italian restaurant’s table. What I came to find is that ricotta donut holes are the most heavenly start to a weekend you could ever experience. Forget long-winded brunches with your closest friends, sipping your coffee quietly while listening to indie brunch music while the birds chirp, sleeping til the afternoon – no, in order for you to start the weekend off right, you really need to pop out of bed, get over to the farmer’s market and demand one of these fritters. Ok now that you’ve decided what you’re doing this weekend….recipe!! 1. Start by turning your oven on to 400-450. Slice the squash lengthwise and scoop out the inside pumpkin-y stuff until it’s smooth. This can be confusing because I know you think that the stringy part is the spaghetti but in fact, it’s not. Rub olive oil over the inside of the cavity and sprinkle with salt n pepp. 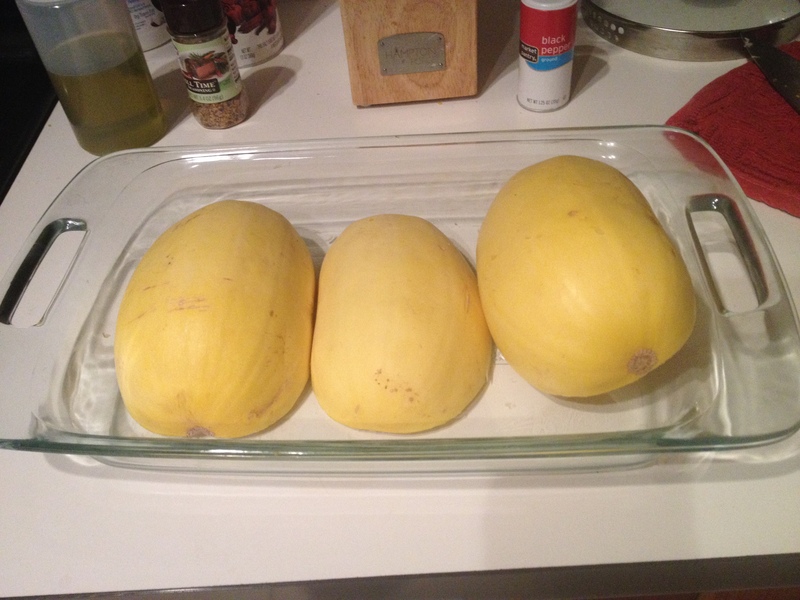 Place squash halves down in a baking dish and place under the oven for 35-50 minutes, turning throughout. I always roast them cut side down but this recipe said cut side up so we rotated…. 2. 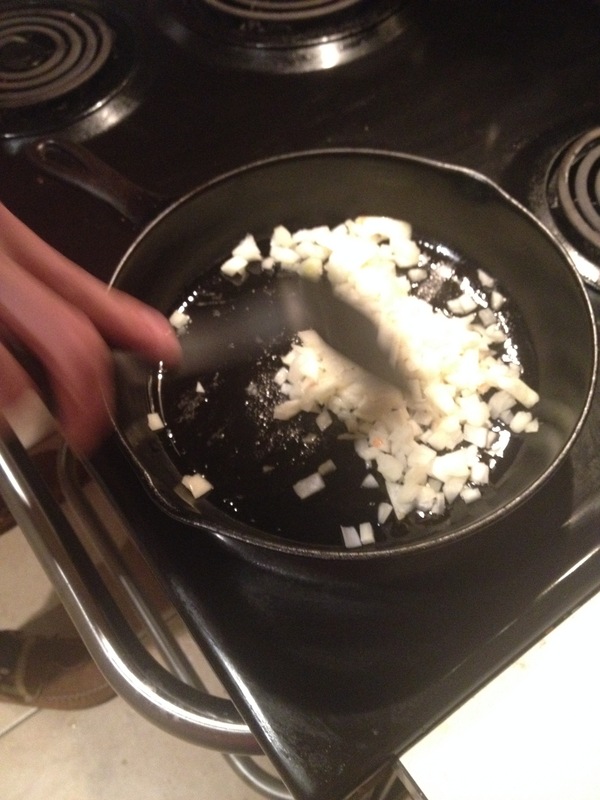 Heat a cast iron skillet or other wide skillet to medium high head and saute your onion for 5-6 minutes until they start to look translucent. 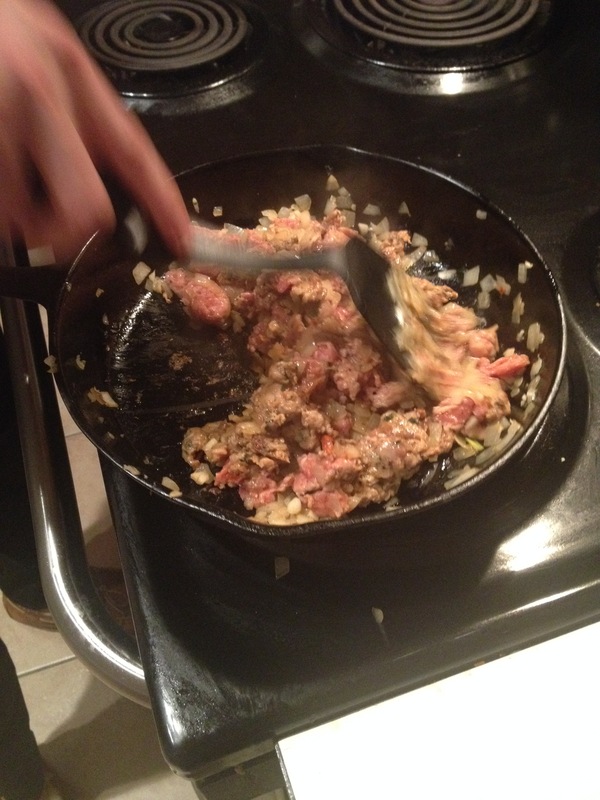 Add garlic for 2 minutes more, then add in sausage, breaking it up after taking the sausages out of their casing. Cook the sausage for 10-12 minutes until brown and cooked through. 3. At this point you can fold in your kale – you want to remove as many of the tough stems as you can. If you get the bank of kale you can just rip it off, if you’re using a more sturdy kale you can cut ribbons off the stem. Wilt the kale in for another 3-5 minutes until soft. 4. 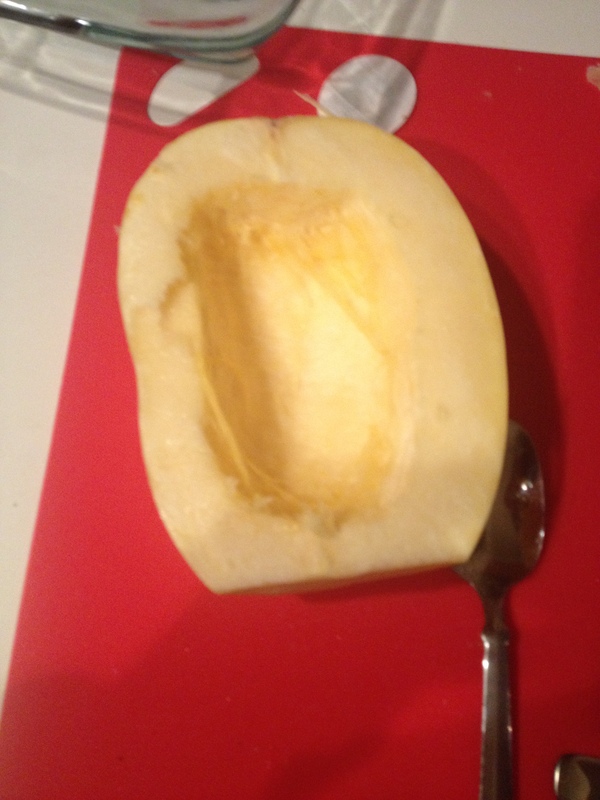 Back to the squash….when the insides are fully cooked you can poke through them easily with a fork. Take them out of the oven and scrape out the insides with a fork, shredding the “spaghetti”. 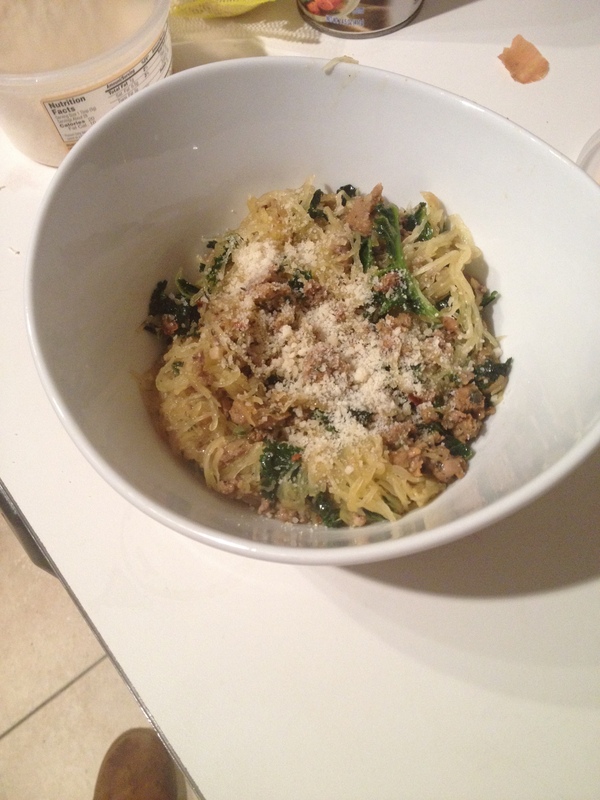 Mix in with the sausage kale mixture and you can either put the mixture back in the squash boat or in a bowl. Looks amazing! I bet it smells super delish when you’re sauteeing the onions, garlic and sausage. Totally gonna try it. Btw, I have an amazing butternut squash soup with sausage and quinoa I think you’d like. Ooooohh that sounds amazing Jenn! I’d love to try it.